So far, as part of our America Recycles Day blog series, we’ve challenged you to familiarize yourself with your local recycling programs, and learn the ins and outs of recycling plastic. 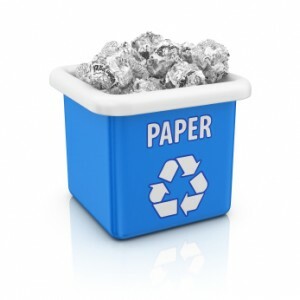 This week we take you through the process of recycling paper. As the world’s largest, privately-held 100% recycled paper and packaging company, it’s a topic we know quite a bit about! Every year Pratt Industries already diverts 1.8 million tons of waste paper from the landfill and convert it into 100% recycled corrugated packaging. Did you know that recycling one ton (2,000 pounds) of paper products can save 17 trees and three cubic yards of landfill space? Considering that paper makes up the largest percentage of solid waste sent to landfills, recycling paper can have the largest impact in landfill diversion efforts. The process of recycling paper starts with you! According to a 2007 AF&PA Community Survey, 87 percent of the U.S. have access to some form of recycling program. Through community curbside programs, drop-off centers, school recycling and office recycling, paper goods are collected and transferred to a recycling center or Material Recovery Center (MRF). There the material is sorted into its different grades, contaminants are removed, and the resulting fiber is compacted into large bales – ready to be transported to a paper mill for recycling. Using the recovered, baled fiber, a pulp is created by mixing in water. The pulp is washed, refined, cleaned and beaten into a slush. That slush can then be used to make corrugate, newsprint or office paper, depending on the grade. To learn more about this process, check out our video on the recycling journey of a pizza box. The paper industry has set a goal to increase recovery for paper recycling to exceed 70 percent by 2020. Do your part and recycle! Kick off your personal recycling efforts by participating in an America Recycles Day event on November 15th. We’ll post a list of all the events Pratt Industries is sponsoring in our next article of the series.